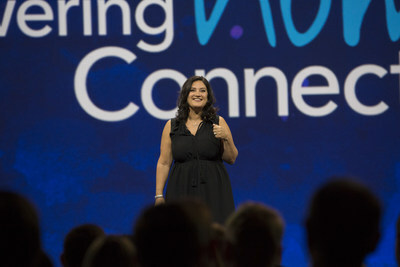 LAS VEGAS, May 2, 2017 /PRNewswire/ -- Today at JiveWorld17, Jive Software, Inc. (Nasdaq: JIVE) CEO Elisa Steele addressed the increasingly disconnected nature of the business landscape, and showed how Jive is fulfilling its promise to enable enterprise collaboration at any scale, reduce team and technology silos, and accelerate go-to-market execution. With the explosion of single-purpose apps, siloed messaging platforms and a myriad of office tool solutions, employees are often left overwhelmed and unproductive. Jive's vision is to overcome this challenge by delivering a collaboration hub that intelligently connects people, systems, content and networks inside and outside of organizations. In Las Vegas this week, the company previewed its next-generation capabilities, which are expected to be available by the end of 2017. "Today's most competitive companies don't work based off of org charts. They dynamically form teams around projects that expand across departments, companies and ecosystems. If you factor in all of the people, systems, IT infrastructures and security compliance requirements that are involved in business collaboration, these environments have become more complex and fragmented than ever before," said Elisa Steele, CEO of Jive Software. "We've been relentless in our focus to deliver on our Next-Generation Cloud Platform and advance the science of collaboration. As a result, we're not just enabling stronger connection in the workplace, but driving deterministic business outcomes that strengthen execution." Connect networked ecosystems through universal identity—Later this year, Jive's solution will support a single identity, enabling people to seamlessly interact with content and colleagues across their employee, partner and customer communities. Jive's new architecture will also use metadata to power an entitlements-based universal search—the only solution in the market that will bring content and people together across the entire business ecosystem without replication while enabling immediate collaborative action on any piece of content without leaving Jive's user experience. Provide a common collaboration layer across applications and organizations—Jive's new collaboration services, including universal search and integrated contextual conversations, will power collaboration at any scale, in any system, for any team working across an ever-changing digital landscape. Leverage network intelligence to grow your business and improve operations—One of the most distinctive benefits of Jive's collaboration hub is the network intelligence surrounding the connections between people and content that form and strengthen every day. Businesses today are challenged regarding how work happens in the digital landscape of the 21st century due to the complexity of collaboration across always-changing business ecosystems. The Jive WorkGraphTM is the first to enable predictions that uncover latent business value and hidden profits through the use of big data analytics and artificial intelligence (AI). Steve Phillpott, Western Digital's chief information officer, described how Jive played an instrumental role in the company's two recent acquisitions by quickly and efficiently engaging employees around the world and updating them on integration progress. Jive's collaboration hub enabled Western Digital to link the combined companies' numerous operational systems and make data easily accessible, while retaining the knowledge base of corporate memory across these organizations. Special guest Dacher Keltner—one of the scientific minds behind the popular Pixar movie 'Inside Out' and professor of psychology at the University of California, Berkeley—spoke about how important human connection is and how it relates to trust, safety, performance and survival. In addition, leaders across the healthcare and federal industries convened at the Jive Healthcare and Federal Summits yesterday to exchange ideas and best practices, and further explore the key role that connections and collaboration plays within their markets. JiveWorld17 is the industry's premier conference for communication and collaboration, offering more than 60 customer-led breakout sessions on best practices in optimizing employee, customer and partner connections and driving stronger communities for measurable business outcomes. Presentations include speakers from Akamai, Dell, DISH, Leidos, McGraw-Hill Education, NASA, Pearson, Providence St. Joseph Health, Telefónica Germany, T-Mobile, the U.S. Army and Verizon. For more information, follow @JiveSoftware or #JiveWorld17 on Twitter, and for the complete list of JiveWorld17 news, please visit the Jive Software News Room.